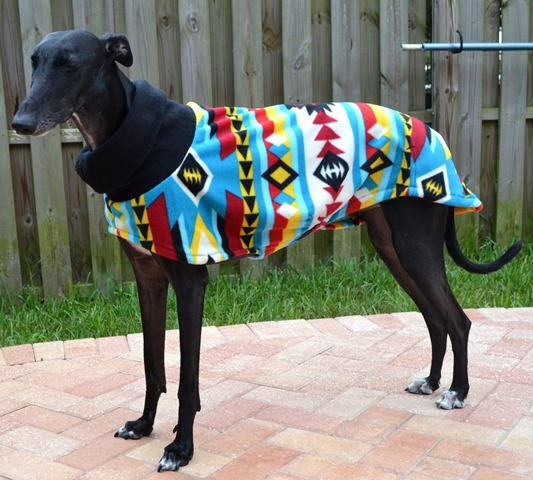 Paco (pictured) is stunning in the Brilliant Southwestern Jacket, a bright pattern in colors of turquoise, yellow, red, white & black. The Jacket style is longer and covers the rear. Black Fleece cowl neck can be worn up or doubled and rolled down. Perfect for chilly walks or keeping toasty warm in the house. Darted in all the right places for a beautiful fit. 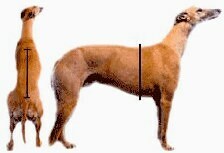 Small = Fits Girth 29-31 inches (Largest circumference of chest). Length is 28" inches. S/M = Fits Girth 32"-34" inches (Largest circumference of chest). Length is 29" inches. M/L = Fits Girth 34"-36" inches (Largest circumference of chest). Length is 31" inches.